"This glaze is really wonderful on salmon, but equally delicious on swordfish, halibut, tuna, or any other firm, full-flavored fish." Season salmon fillets with salt. Place salmon on the preheated grill; cook salmon for 6 to 8 minutes per side, or until the fish flakes easily with a fork. Combine water, rice vinegar, brown sugar, chile paste, ginger, garlic, and soy sauce in a small saucepan over medium heat. Bring mixture to a boil, reduce heat to medium and simmer until barely thickened, about 2 minutes. Sprinkle basil on top of salmon; spoon glaze over basil. 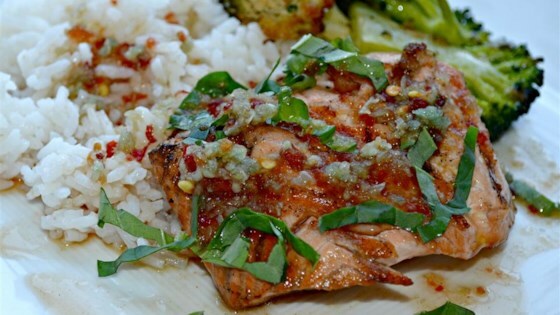 Pretty good but its the typical sauce for salmon found on this website but with the addition of hot chile paste. Don't get me wrong, it's good and worth a try.